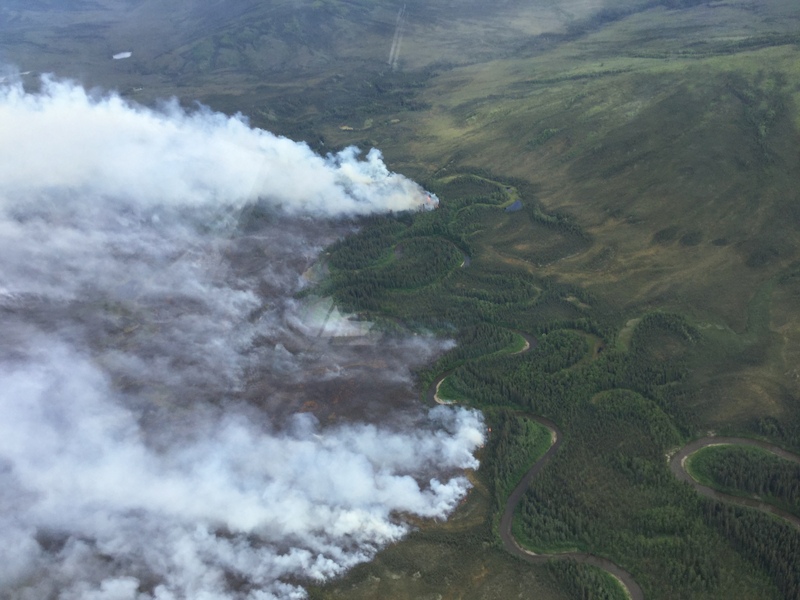 June 18, 2016 — Smoke from the Big Mud Fire burning roughly 37 miles southwest of Tanana drifted into parts of Interior Alaska last night and will to move over the northern Interior tonight, according to the National Weather Service. The Big Mud Fire, which has been burning in the Nowitna National Wildlife Refuge Smoke since the beginning of June and is now estimated to be 50,000 acres, became very active yesterday. Wind blew smoke into eastern Interior, mainly north of Nenana to the Yukon River this morning. Reports of smoke were received from Nenana, Fairbanks, Manley Hot Springs, Central and Allakaket last night. With winds turning more from the south this afternoon, smoke will impact central and northern Interior west of Fairbanks tonight. Rain should help over the next few days should limit the smoke. The Big Mud Fire received some light showers last night and this morning that has helped calm some of its fire activity. A BLM Alaska Fire Service aircraft flew the area this afternoon to check on the fire and estimated it had grown to 50,000 acres due to the hot and dry weather the area received the past few days. The area was under cloud cover and more showers are expected today. Eight BLM AFS smokejumpers have been on the ground for three days doing structure protection around a U.S. Fish and Wildlife Service permitted cabin. First, they cut a fireline and laid a hose line used connected to a water pump to help protect the cabin. Yesterday they successfully performed a burnout operation around the cabin and will do more burnout to fortify the protection efforts today.